Many players dream of owning a push-button team as a means to quickly clear dungeons to acquire plus eggs. However, most of the staple subs are hard to acquire Rare Egg Machine monsters such as Red Odin , Awoken Ra , and more Red Odins. If you are as lucky as I am and own neither, you may feel distraught or left out. But have no fear, Mantastic is here! With a fully farmable push button team that can blaze through Wailing Wind in Mechdragon’s Massive Fortress via coop. The run takes around 70-75 seconds to complete and is essentially brainless. Just don’t mess up the button order and please enter the Wailing Wind level as your fire damage is twice as effective. The key to creating this Fantastic team is a fully evolved Goemon , 3 fully awoken Flame Armour Ogres , a sub to generate sufficient skill boosts, and one player needs a sub that deals true damage that is above 3,000 damage. None of your team requires plus eggs and I only encourage you to have your leaders max awoken and level to ensure sufficient damage on the full-fire board swap. Where to easily acquire Flame Armour Ogres? Flame Armour Ogres can be easily acquired via the Legend difficulty of Monday Dungeon and have a 50% chance to drop. If you are farming for ranks, please save these ogres. You need to acquire 3 as your base and 6 additional to max awaken by feeding 2 to each base. Skill ups do not matter. How many skill boost awakenings do I need? The answer depends on how skilled up your Goemons are. Your 2 leaders plus 6 Ogres provide 14 skill boosts and a max skilled Goemon can achieve a 15-turn cooldown (unskilled is 20 turns). However, the second Goemon can have one less skill up as you need to match orbs on floor 5 and thus providing a single turn of active charging. You do not have to use Bane like I did and can easily opt for a Red Odin, Awoken Ra, or even a 4th Flame Armour Ogre to deal enough damage to kill floor 9. The key is the 3 Flame Armour Ogres, sufficient skill boosts, and an extra damage source for floor 9. I encourage you to bring someone like Yamato or any other fire orb maker if something goes wrong. If you are unfortunate to encounter the Chaser invade, you will not be able to button your way through it and you must match fire orbs and is the main reason why I encourage you to bring someone such as Yamato to generate fire orbs to handle this annoying threat. Furthermore, the green Mystic Knights have just enough HP to survive the Flame Armour Ogre’s attacks and you must match some fire orbs to kill it. Just make sure the correct person has the turn on floor 9. Using a push button team is fun and exciting to play as you will be able to quickly farm plus eggs. 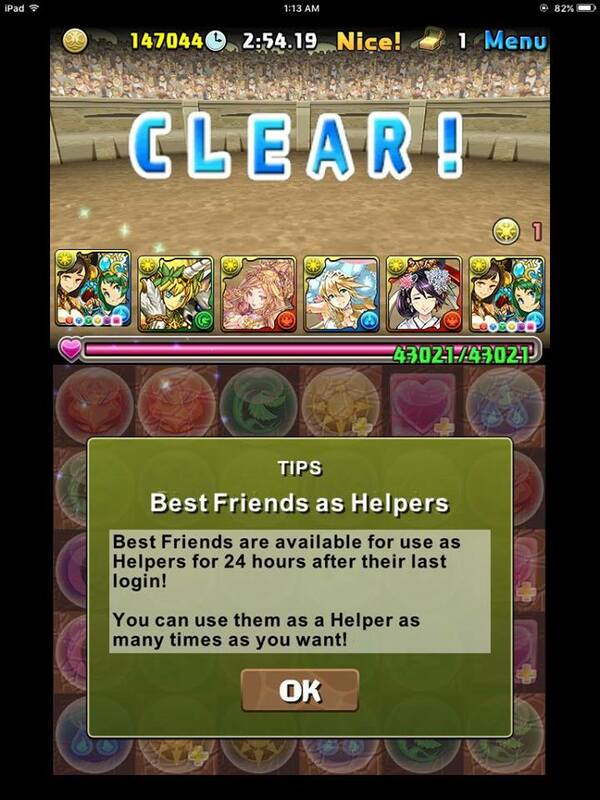 Being able to clear dungeons quickly does not improve efficacy, you still need to spend the same amount of stamina. Let me know how you plan to quickly farm plus eggs in the comments below. Well she is actually Mantastic because she was my only roll from the Wedding REM on that account. I normally avoid Collab REMs due to the poor drop rates and low value silvers. However, for Dawn Bride, Izanami , I had to make a special exception. As detailed in my full REM Analysis, the June Bride Collab is one of the strongest to date in terms of value from the low and high end cards. Furthermore, the sheer value Wedding Izanami brings to the table is unparalleled to almost any other 4-star Collab roll. The few drawbacks include no SBR , low base stats (707), cannot use as an assistant for Skill Inheritance, and lower dependency on shields due to tankier teams and coop. Perhaps the timing of the June Bride REM was done to coincide with the release of Awoken DQXQ who has emerged as a powerful lead to run. She does suffer from a lack of HP / RCV multipliers, but coop addresses the health issue and you are able to stack healers, enhanced heart orb awakenings, and abundant heart generating actives to compensate. Thus, DQXQ is a capable of producing spectacular amounts of damage and has modest durability. For a more detailed team building discussion, please refer to my analysis HERE. Row-based teams are able to benefit from enhanced light orb awakenings after reaching 10 rows along with providing a sizable increase from skyfall damage. As such, Wedding Izanami fulfils this requirement as she can single handedly ensures every light orb that appears comes with an enhanced status. This is amazing when trying to conserve actives as every 64x light row will almost certainly sweep each floor. 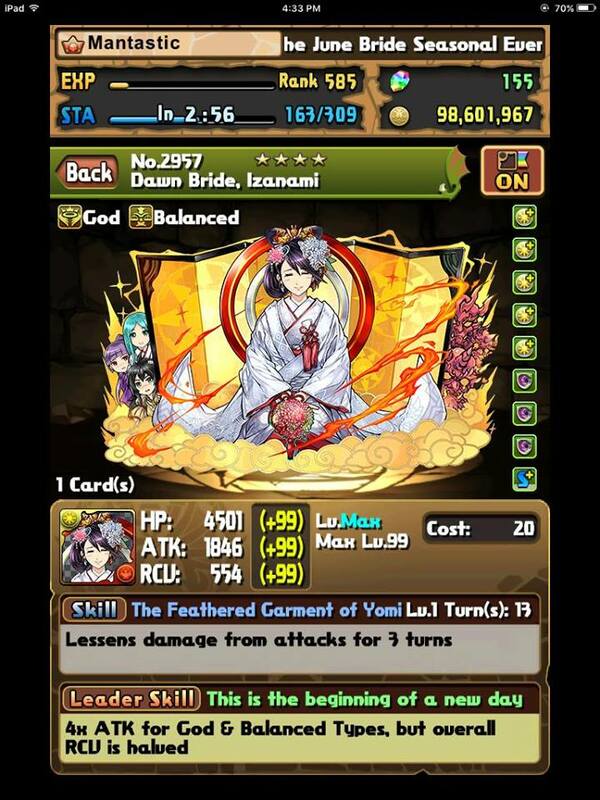 After some brief deliberation, I decided to make the plus egg and Tamadra investment (skill ups will happen when Izanami Descended rolls around) for my Dawn Bride, Izanami. I love playing my Awoken DQXQ team and I want to optimize my team in every way possible and Wedding Izanami is simply the best shielding option I have (and possibly for a long time as Awoken Indra is not as desired for DQXQ unless you need the time extensions or SBR). How am I using Dawn Bride, Izanami? For the most part, I am using Wedding Izanami to farm Arena via coop with Fantastic and Awoken DQXQ. I made a large post dedicated to using DQXQ for Arena and I strongly encourage you to check it out HERE if you have not already. If you look at the new Mantastic team, I am able to fulfill nearly all those requirements with a “flex” slot through Light Kali . Sakuya clears binds and doubles as a 20% gravity to mitigate the Kali threat, Apollo provides massive spike damage, and Wedding Izanami provides the shield to survive DQ Hera and stalling potential for problematic floors. Granted I may have some trouble with Hino, but I am able to use Sakuya’s gravity to push him and utilize the shield to help manage his attacks. However, through coop, I am able to manage every threat Arena can throw at me: even the horrible chain floors that would normally have killed me/greatly endangered my run as I had another panic button through Wedding Izanami. Farming Arena is about consistency and by reducing the risk for additional floors through an on-colour offensive shielding option, you will begin to see better results. Not everyone can run the same set up (nor coop all the time), but I am confident you will find value in Dawn Bride, Izanami. 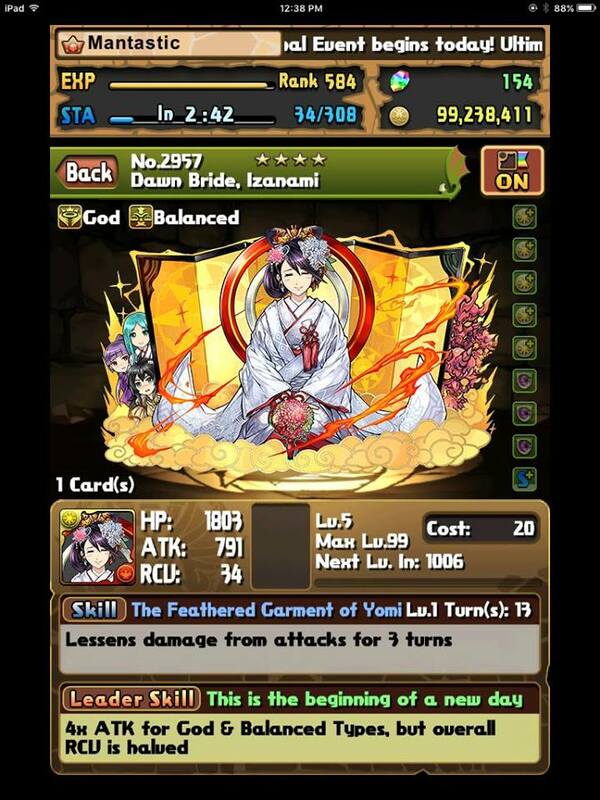 Wedding Izanami is an invaluable roll from the June Bride Collab due to her offensive and defensive utility. She truly shines on rainbow teams as an on-colour shielding sub who also adds massive amounts of damage through her 5 enhanced orb awakenings. You may not need her in every single dungeon, but it is ideal to have her available as she is arguably the best in slot defensive option for Awoken DQXQ teams. Wedding Izanami is almost essential for teams who are planning on doing Arena solo as you need to survive DQ Hera. Finally, her 4-star rarity helps ensure you pull her quickly and is easily worth a few pulls worth of Magic Stones to acquire. Do you agree with my analysis and do you plan on rolling the June Bride Collab? Let the church bells ring, hear the fan boys sing. There may be the background wail of countless wallets crying out in horror, but nothing can dampen our spirits for the June Bride Collab! This festive REM features some of the most loved characters in Puzzle and Dragons all dressed up for their big day to tie the knot. Sporting flowing dresses and dashing suits, this event is sure to please every player. Furthermore, the overarching theme for this June Wedding is Light and if you are looking to brighten up your team, this may be a great place to spend your magic stones. In addition to the great value the rare rolls provide, Light Izanami is perhaps one of the best 4-stars to ever come out of a Collab REM. Awoken DQXQ was released yesterday in North America and it has felt like Christmas ever since. I initially started playing difficult content with Sakuya in all her various forms but was forced to make a soft transition to mono colour teams that were row oriented (Lucifer and Blue Sonia ). These teams offered more survivability, burst damage potential, and consistency. Thus, with the release of Awoken DQXQ, I was overjoyed to combine the two elements of rainbow and rows into two pretty girls. The purpose of this post is to showcase how I have been clearing Arena (10+ times as of this posting) in coop with my two accounts, Mom’s account, and a friend. Being able to tackle Arena via multiplayer alleviates some of the weaknesses DQXQ faces, but she is still capable of soloing with the right set up. If you have not already, I strongly encourage you to read my Awoken DQXQ Analysis and Team Building Guide to gain a better understanding of how to compose and utilise your team. The following video was a relatively straightforward clear of Arena 1 with only some problematic floors and minor errors. Good job me and me. Outside of poor comboing towards the end, the video should give you a relatively good idea of the playstyle and where I choose to stall and use actives. 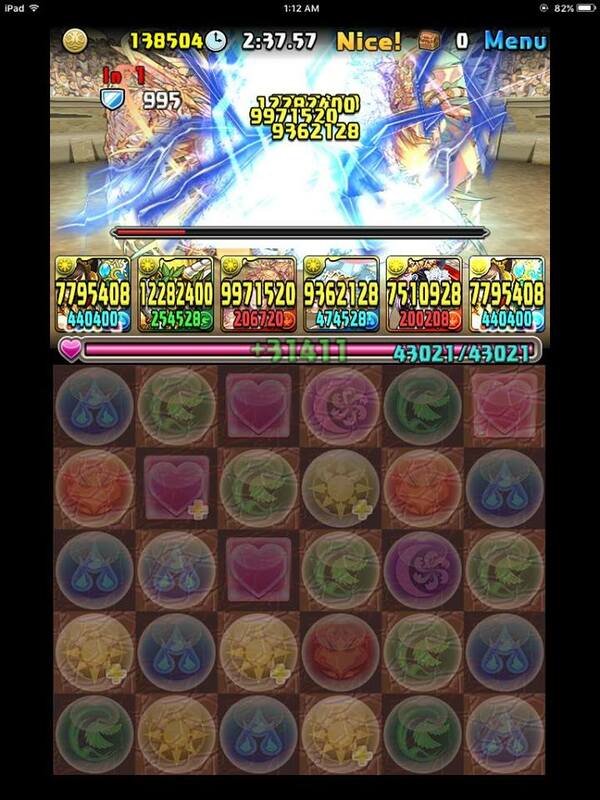 I always prioritise using my DQXQ’s actives first as they recharge twice as fast in coop. 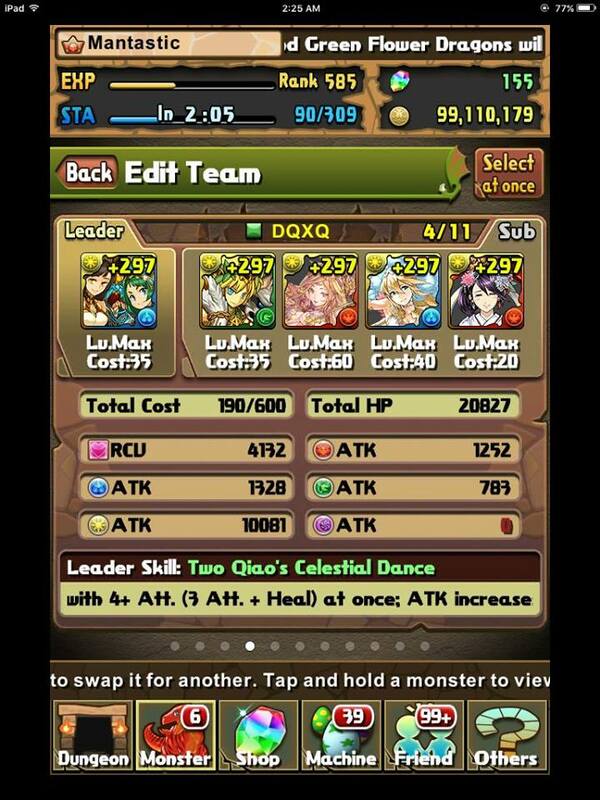 Awoken DQXQ is a hybrid rainbow/row leader that requires any 4/6 elements to trigger her base 16x multiplier. However, you are able to match multiple connected Light OR Water orbs to bolster your damage further. 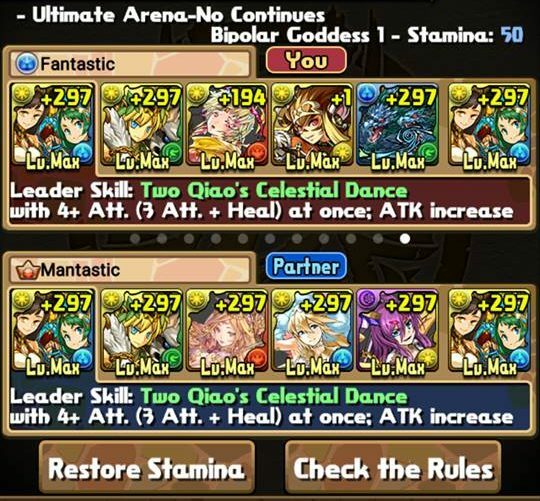 Awoken DQXQ: New Top Tier Lead? Awoken DQXQ has been announced and released in NA (finally) to great fanfare and excitement. But why such hype and eagerness for her to go live? It cannot simply be the fact the two sisters are finally reunited (it broke my heart when GungHo decided to split them up) or that they promise to double your fun. As such, I wish to explore her new found power and viability.